Sadurday Jan, 5th 2013 Wow! I am seeing/feeling the Holy Trinity EVERYWHERE I look now guys! I truly believe this is a sign -Several signs repeatedly in fact that the Twin Flames are coming together in a big way right now! -And in doing so, bringing the true sense of the Holy Trinity back onto Gaia once and for all! So in other words, reprogramming as through Divine Intervention, that Holy Trinity within each and every ONE of us and in turn, through us individually, that Holy Trinity returns to ALL Humanity alike! "Once and for all!" I see the Holy Trinity of the Divine Masculine, the Divine Feminine and their Combined Creation EVERYWHERE!!! I FEEL it within me growing! I feel my WISDOM Growing! I feel the LOVE Growing! And with this in balance inside me, I FEEL EmPOWERed! Is that not the Threefold Flame Trinity within our Sacred Hearts?! ;) WISDOM, POWER, LOVE!!! ;) And with this EmPOWERment within, we each individually spark this birth within ALL Humanity Alike! And the Threefold Flame is then birthed from us as yet another Trinity again! -The Vesica Piscis; Father God, Mother God and the Womb of Creation. That is why my "Living Meditation" is so incredibly powerful and useful of a technique in accelerating one's individual ascension process. 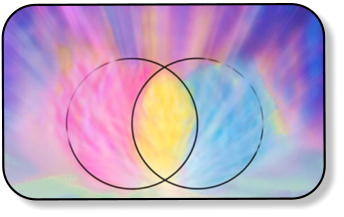 If you want to break it down: Vesica Piscis = Father God / Mother God / Womb Gives birth to The Threefold Flame = Wisdom / Power / Love And when unlocked/created, you can use my: "Living Meditation" = Knowing / Feeling / Being Or = Sacred Mind / Sacred Heart / Incarnate Body Or = Highest(God) Self / Higher(Soul) Self / Physical Self Or = Divine Willpower / Deliberate Intent / Manifest Experience What I have done with these ancient teachings for my "Living Meditation", is to show those links between KNOWING, FEELING, BEING, 1)where precisely these things come from, 2)that they come through into our physical experience through the Sacred Mind and Sacred Heart and then 3)to take it further so that we can have an actual "tool" structured by these teachings in that our Divine Willpower holds ALL KNOWING, our Deliberate Intent holds ALL OUR FEELING, and when we experience those two things as ALL THAT WE ARE in our BEING, that is when we truly hold the keys to our Manifest Experience. What I am doing here is showing ALL Humanity how they can truly BE Master Creators with all the same potential as any soul. And that alone is the Holy Trinity at work with YOU/US! So be joyous in the creation of your THOUGHTS! So be mindful of your FEELINGS! And your MANIFEST EXPERIENCES will be those of DIVINE WILL ORDER as through your very own DELIBERATE INTENT! Are you following/feeling the theme here?! The key to Ascension and manifesting your aspirations is through aligning oneself in balance with the natural Trinity of Unconditional Love as a "Living Meditation!" Just as with the current vibrational resonance of all the Ground Crew here and now, this Holy Trinity will indeed ignite within ALL Humanity alike as the GOD SPARK BEINGS of ALL Creation! 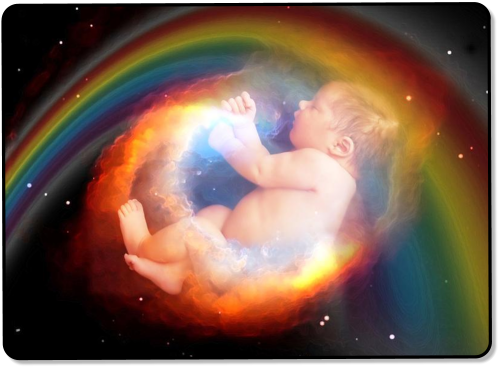 Just as within this image; The Divine Masculine Light of the Rainbow as through Father God providing a safety blanket of WISDOM from above, The Divine Feminine Love of the Physical, Earthly and Cloudy Womb as through the Mother God providing a nurturing cradle of Unconditional Love from below, both of which together are metaphorically birthing the New Ascended Human Child that will bring Gaia back into the Ascended Realms of SPIRIT! And Humanity will once again return to their true Cosmic Nature as Human(WHOLE MEN) Beings, reclaiming their birthright among their brothers and sisters among the stars! Keeping my Faith, because I KNOW I'll be found too soon enough! -Or perhaps I'll find HER! -My twin, but regardless however we come together, I KNOW I will feel part of something anew here with Gaia! -Something I've been longing for my whole life! :) <3 Jacob ..all my love and adoration, Jacob Oh, on a side note and all in good fun, the Angels like to give me songs based on what I'm thinking about. This has been going on for as long as I can remember. Too funny when a song I haven't thought about in many many years suddenly comes to mind. Anyways, here's the most recent of those: Huey Lewis "The Power Of Love" The power of love is a curious thing make a one man weep, make another man sing Change a hawk to a little white dove more than a feeling that's the power of love Tougher than diamonds, rich like cream Stronger and harder than a bad girl's dream make a bad one good make a wrong one right power of love that keeps you home at night First time you feel it, it might make you sad Next time you feel it it might make you mad But you'll be glad baby when you're found that's the power makes the world go'round And it don't take money, don't take fame don't need no credit card to ride this train It's strong and it's sudden it can be cruel sometimes but it might just save your life They say that all in love is fair yeah, but you don't care But you know what to do when it gets hold of you and with a little help from above you feel the power of love you feel the power of love Can you feel it? Hmmm Please consider “Sharing” this page with your friends and family. Or you can “Like” Divine Willpower at the top of the page.